Vaccinations, the genius invention that altered the course of medical history, come with a potentially fatal flaw: They’re administered via syringe, and if the syringe is reused or otherwise contaminated, it can contribute to, rather than prevent, the spread of infectious disease like HIV. Most clinics in the U.S., for example, have trained personnel who know to dispose of old syringes. But considering that 17 billion injections are administered in developing countries each year–where supplies are scarcer and consistency in training is varied at best–the reuse of single-use syringes poses a deadly threat. 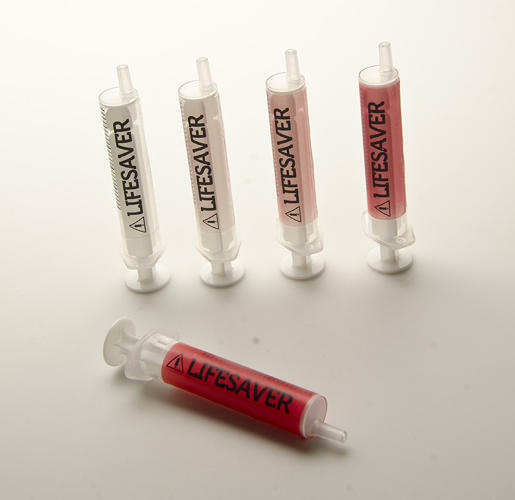 “The sheer scale of unsafe injections practices means that just a 5% effect has real significance for global patient safety,” says Dr. David Swann, whose team at Huddersfield University in the U.K. has come up with a simple solution in the ABC Syringe, which uses basic color coding to signal sterility. Swann points to research from an affiliated charity, SafePoint Trust, shows that in developing countries, the average patient receives an unsafe medical injection more than once every year. Auto-disable syringes exist, but they cost more than basic supplies. The plastic tools created by Swann’s team are injected with a colorimetric ink that goes from clear to bright red once exposed to oxygen for 60 seconds. Syringes are stored in modified-atmosphere packaging–technology also used to preserve the shelf-life of products like vacuum-packed meats–until use. For added protection, the plastic interior of the syringe features geometry that isn’t compatible with other standard plungers. Beyond the ABC Syringe’s most immediate implications, the system packs a valuable lesson in designing for systemic public health problems. “The auto-disable syringe had shown that attaining 100% patient safety was an illusionary aim,” Swann tells Co.Design. This realization was a game changer: “We opted for an affordable, transformative label that could affirm sterility and prior use,” he says. By working with a simple means of communication (color coding) and a cheap technology (modified air packaging only increases the syringe cost by 1%), the team targeted a scalable solution. Swann says that the ink and packaging approach of the ABC Syringe could be applied to other invasive sterile devices, like surgical gloves and needles. It presents a much needed shot in the arm in the global fight against infectious disease.